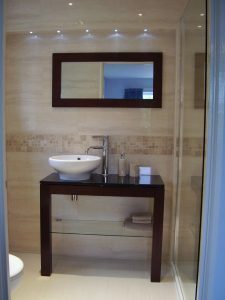 We use all our experience and expertise to offer you the best in bathrooms design and installation. With careful consultation with every customer, Stewart Domestic Plumbing will contribute ideas and technical knowhow to the design and planning process, and our detailed product knowledge to help you choose the right. The key to producing the best outcomes for any installation is in the planning stages. We work closely with you to create a design based on the real dimensions of the space available, and any existing plumbing or electrical services. That way we can ensure that we know exactly what preparatory work needs doing before we begin installing the suite, or tiling the walls. Careful planning also ensures that the space is thoughtfully used, and the ceramics will fit perfectly first time. The building part of any new bathrooms are likely to cause inconvenience, but with Stewart Domestic Plumbing you know that we’ll work hard to keep disruption to a minimum. We keep on schedule, tidy as we go and always let you know when the water will be off, helping you plan your life around the installation. As a small, local and well established company we rely on our reputation for excellent work at reasonable prices. We like to make sure our customers are 100% happy with their bathrooms every time, and our customer care delivery is first rate. If you want to find out more about a bathroom installation in Derby or further afield, why not get in touch for an informal discussion. We can discuss initial design and provide a free, no obligation quote.